Celebration of the Season comes together perfectly at Registration Weekend this year. 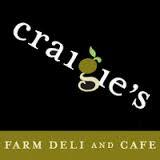 Craigies Farm Deli and Café has partnered with Linlithgow Rugby Club for this season. LRFC will be celebrating the start of our rugby season at Registration Weekend on 29th & 30th August. Craigies Farm love to celebrate their fresh seasonal local food and have donated a delicious Food Hamper. Members registering and re-registering that weekend will be entered into the draw to win this fantastic prize. Come down to the clubhouse on Saturday 29th, there’s lots going on; the Bennie Ba’ (7’s Touch Tournament), BBQ , bar and screening of the Scotland v Italy match on the big screen. Members are welcome to bring friends and family, those interested in playing or joining can be given more details. It will be great to see you all down there. We will also have merchandising available on both days and, on the Sunday, we plan a kit exchange. So bring down any items of rugby kit no longer required and, for a £1 or £2 (dependent on quality of item) donation to the Club, others can ‘purchase’ any exchange item. We have re-started the Bennie Ba’ this year, with a real focus to boost the relationships within the club based upon the back of the Coaches XV game earlier in the year. The Senior Squad have identified a weekend with no preseason games and Chris Bredin, the Club Captain, is very keen that we use this opportunity to build intra-club relationships. The aim is that we will have around 25-30 players from each of U-18, Senior Squad and Coaches/Parents. We’ll aim for 8 teams of around 10 players each, with an even mix of each of the 3 groups. Splitting the top pitch into two, we’ll have two groups playing round robin sets of games, with the Winners and Runners Up of each group coming together for Semi Finals and Finals. All the games will be touch 7s, a single period of 7 minutes each. Following the games we’ll retire to the bar for beers and the joy of Scotland v Italy from BT Murrayfield (KO 3-15pm). Davie Bennie will be there to present the Bennie Ba’ trophy to the winning team. Calling all Club members to come down on Sunday afternoon to help out with preparing the Clubhouse and Ground for the season ahead. We plan to get underway after Mini / Micro training at 1pm. All we ask is that you come down in old clothes, bring some gloves and a spade (if you have one) for the work and also some cash for a drink afterwards!